We woke up to rain. Again. 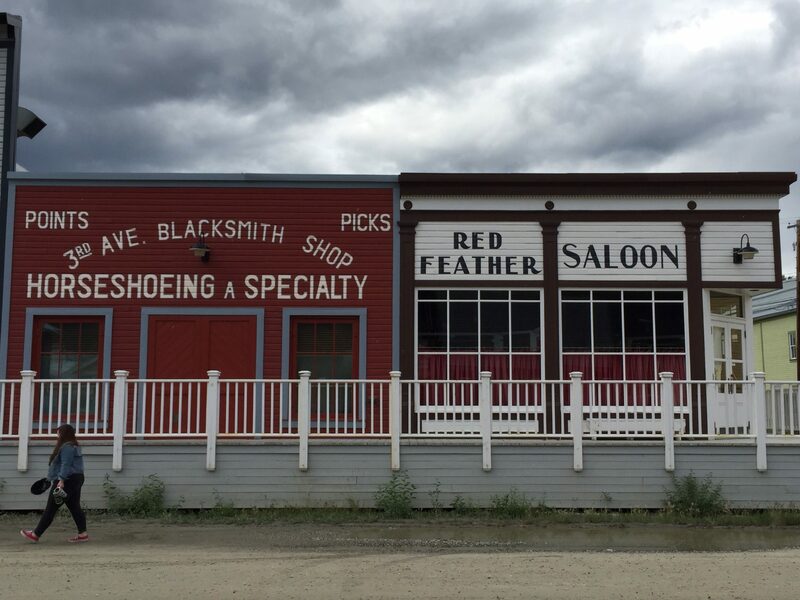 Bugged out of Tombstone and headed to Dawson City. Much to my relief, our repaired tire held out. First stop was the NAPA store/mechanic shop. We dropped the tire off and went off in search of a campground and food. 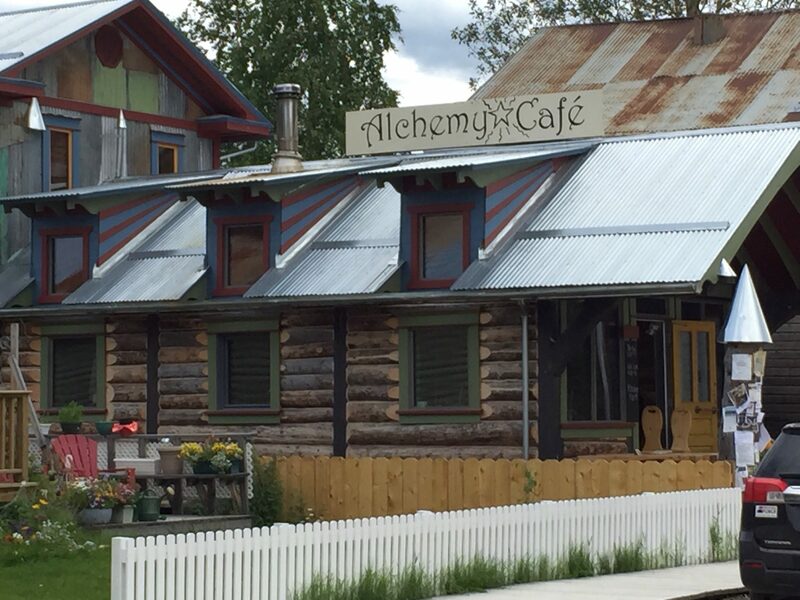 We ate lunch at this little hippie coffee shop called the Alchemy Cafe. Best Latte in town. When we arrived back at the tire shop we found out that the tire without the Slime was not repairable. If you have been following along you’ll remember that we got 2 flat tires on the Dempster yesterday. We put the spare tire on and used Slime tire repair goo on the other tire. Lucky for us, when we decided to change out one flat tire for the spare and Slimed the other one, we Slimed the right one. According to the mechanic at Northern Advance Mechanical, the puncture (slice) on this one was too large for Slime to have worked. We would have wasted the only bottle of the stuff on the wrong tire. Talk about luck. 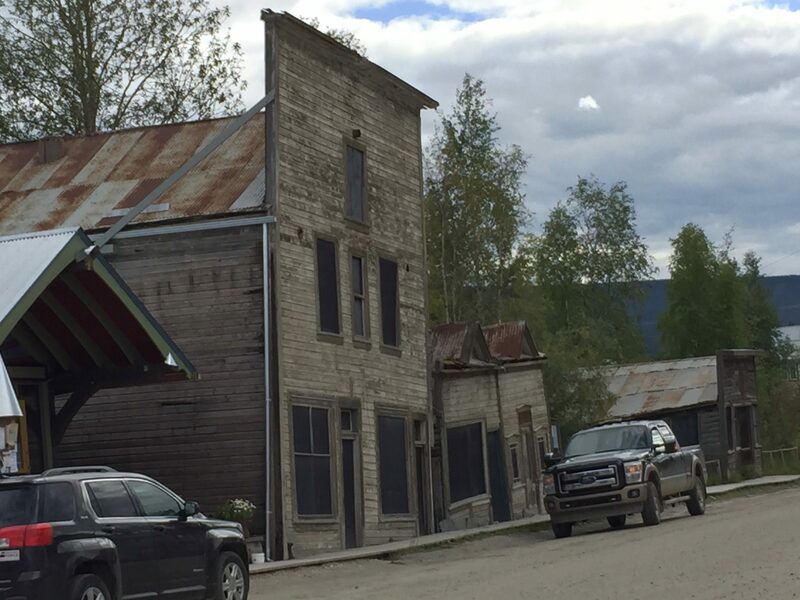 Unfortunately, there was not a 265/17 tire to be found in Dawson City. Apparently, they go through these often. Imagine that. So NAPA ordered one from their store in Whitehorse. 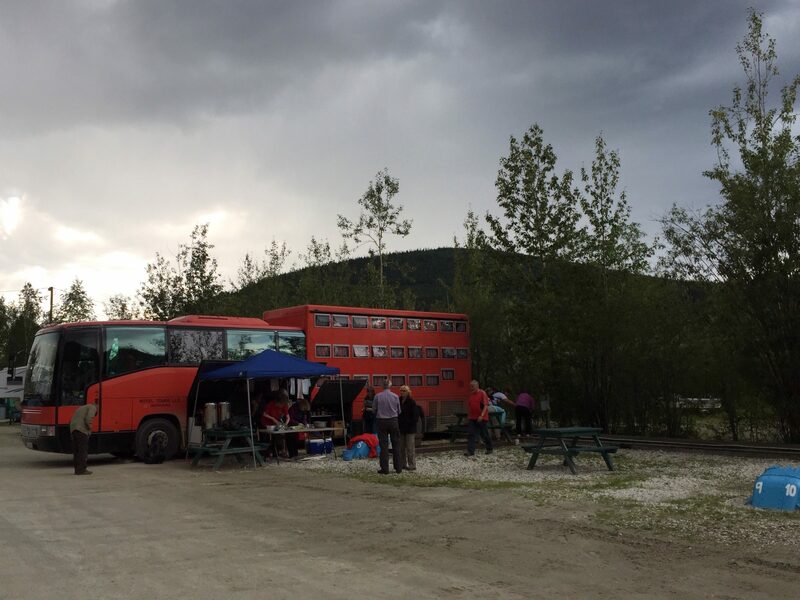 The truck with their weekly supplies was 15 minutes from leaving for Dawson when we placed the order. There is no certainty that it will make it onto the truck and arrive in the morning. If that is the case we will have to wait until Tuesday-4 days from today. We decided not to venture over The Top (Top of The World Highway to the Taylor) with no spare tire. So we wait for the new tire. Just in case, we did purchase 2 new extra large bottles of Slime. This way we have enough Slime and a spare tire to cover us for 5 flats. My level of risk adverseness has been re-calibrated. We are not moving beyond roadside assistance towing distance without the ability to repair or replace all 4 tires. If the new tire didn’t just cost us nearly $200 I’d be buying 2 of them! We decided to stay at a private campground. Gold Rush Campground is right in town and has showers, WiFi, and a laundry. It’s an RV campground so unfortunately it’s just a big lot with virtually no privacy. But we have nice neighbors. The old hippies to our left who spend all day drinking and smoking, and the Germans to our right in this massive thing pictured below. I’ve seen a couple of them around here. 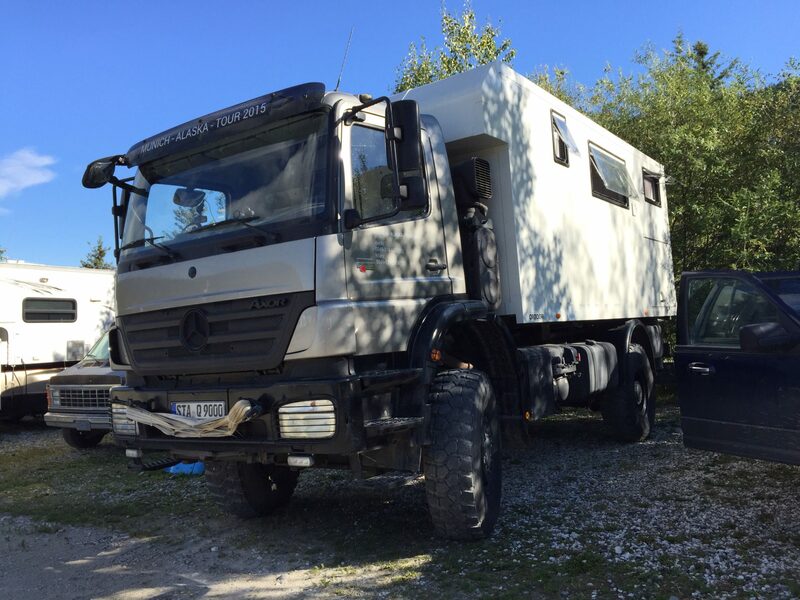 It’s apparently a German thing to travel in obscenely large trucks. This couple is on a 4 months vacation from a German university. The guy is an Economics professor. Not to be outdone, the German tour group on the other end of the campground has a different take on the theme. This thing is a tour bus on Steroids. Later this evening we decided to stop by the liquor store and get a bottle of wine or beer for dinner. Hey, after the last 24 hours we deserve an adult beverage or two. We arrived at the one and only liquor store at 6pm and found that they had just closed. What liquor store anywhere closes at 6pm? We were told by the clerk at the market that any restaurant or bar will be happy to sell us a bottle of whatever we wanted. Sure they are. With the standard 50 percent restaurant markup. No thanks. I’ll stick to club soda. We cooked up some chicken quesadillas and then went to the Aurora Inn for dessert. We’d had a couple of really good dinners there last week and the desserts looked delicious. They did not disappoint. You need all three if you are coming here. I know that now. Tomorrow is another day. 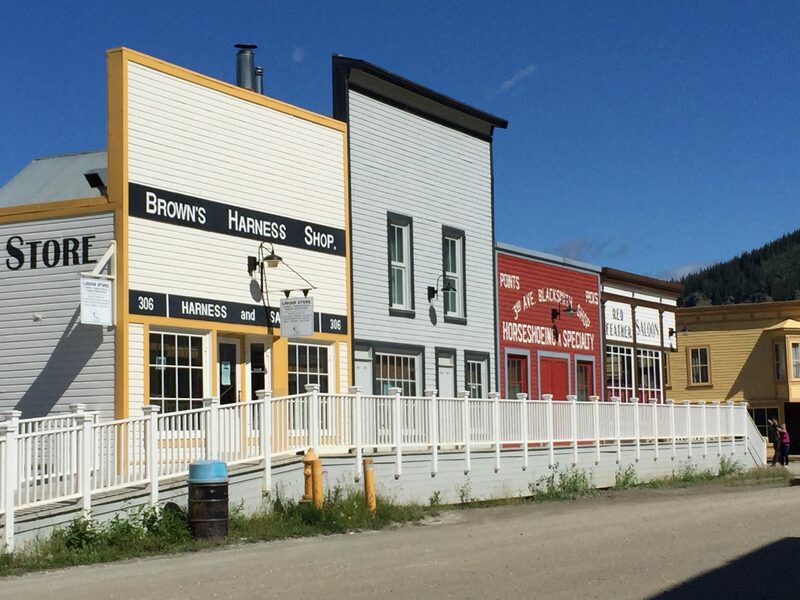 I’ll leave you with some pictures of Dawson City. Such a cute little town on the banks of the Yukon River and the edge of nowhere.